A research team formed by Dr. Takeshi Hanyu and his colleagues at the Japan Agency for Marine-Earth Science and Technology (JAMSTEC) performed geochemical testing of magmatic inclusions hosted within the olivine crystals of ocean island basalts. 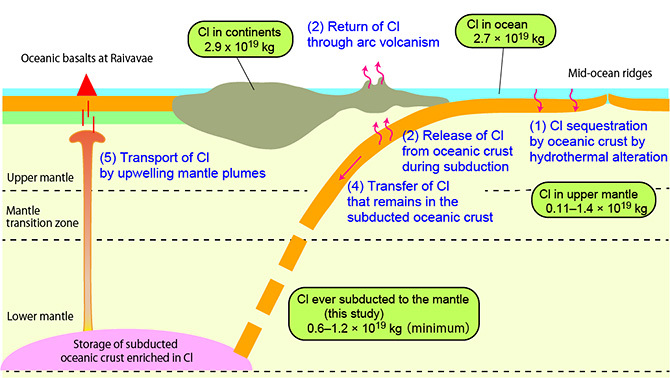 They found evidence that chlorine (Cl) is transferred from the ocean to the deep mantle by subducted oceanic crust, forming a Cl-rich mantle reservoir (Figure 1). The chemical composition of the deep mantle is studied using ocean island basalts related to the rising of plumes sourced from the lower mantle. Previous studies on ocean island basalts have demonstrated mantle-scale material cycling, in which the oceanic crust was subducted and stored in the lower mantle, and then conveyed upward by mantle plumes. However, whether volatiles, such as Cl, are also cycled between the Earth’s surface and the mantle is poorly understood. In their study, the scientists measured the composition of Cl, together with other elements that concentrate in silica-bearing rocks, and lead (Pb) isotopes of olivine-hosted melt inclusions with sizes of 50–150 micrometers in ocean islands basalts from the Austral Islands in the South Pacific. They found that Cl enrichment in melt inclusions was associated with Pb isotopes formed through radioactive decay, which serve as measures of the subducted oceanic crust in the basaltic sources. This indicates that Cl from the surface can be conveyed by oceanic crust that has been altered by the chemistry of seawater and stored in the lower mantle for billions of years. Chlorine enrichment in melt inclusions enables scientists to estimate the total Cl that has been taken out of the ocean by subducted oceanic crust. It is comparable to the Cl in the upper mantle and amounts to 20–40% of the Cl in the modern ocean. This deep sequestration of Cl may have played a large role in moderating the salinity of Earth’s hydrosphere. These results were published in the online version of Nature Communications on January 4, 2018 (JST). Figure 1: Illustration of Cl cycling Chlorine is transferred from the surface to the mantle and then back to the surface by subducted oceanic crust as follows: (1) oceanic crust takes Cl from the seawater, (2) much Cl is lost from the subducted oceanic crust under high temperature and pressure conditions, and then (3) it is returned to the surface through oceanic volcanism; (4) small amounts of Cl remain and sink to form a Cl-rich reservoir in the lower mantle, and finally (5) Cl-rich mantle material is transported by the upwelling of mantle plumes, generating Cl-rich ocean island basalts. In this figure, green ovals show the Cl in major Cl reservoirs. The minimum estimated Cl transported by subducted oceanic crust (0.6–1.2×1019 kg) is comparable to the Cl in the upper mantle and amounts to 20–40 % of the Cl in the modern ocean.